When I looked at Figure in Black (Girl with Stripes) by Robert Motherwell, I immediately thought of a traveler, an adventurer that is undertaking a voyage to an undiscovered land. I was struck by the fact that the figure in the painting is a girl and shown seemingly alone in the work, but unafraid. The songs I have chosen reflect a journey (both physically and within one’s self) from dissatisfaction (Running Up That Hill, Sprawl II) and the thrill of embarking on an adventure (Verdis Quo, Walking on a Dream). I finished the playlist with Yellow by Coldplay as Motherwell was heavily influenced by the ocher color of his childhood in California and the song also feels like a homecoming of sorts. 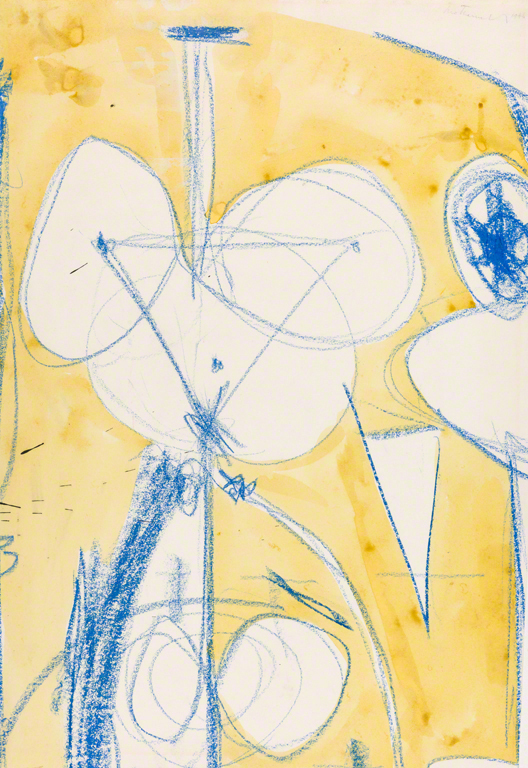 In his witty Concept of Woman, Motherwell exploits his talent as a doodler in both line and color. Doodling was, however, only the first step in a dynamically evolving process Motherwell called “the automatic and formal beauty that is the end result of an emerging process.” In Concept of Woman, Motherwell begins the composition with freely drawn lines and circular forms that eventually achieve a structural rhythm evocative of a female figure. The “real content” of painting, Motherwell argued, was an expression of a person’s mysterious and elusive qualities, perhaps an aspect that underlies this work’s evocative title. Two of the Phillips’s most cherished Abstract Expressionist artists, Helen Frankenthaler and Robert Motherwell, shared more than a style of painting: they were also married from 1958 to 1971. Currently, a group of the couple’s works from the museum’s permanent collection are on display in neighboring galleries. Four of my favorites are Canyon and Runningscape, both by Frankenthaler, and In White and Yellow Ochre and Chi Ama, Crede by Motherwell. Studying these works in a group, I began to think of the differences in the two artists’ styles, despite the fact that all four of the works were created in the early 1960s. I compared the soft applications of oil and acrylic in both of Frankenthaler’s works to the more aggressive elements in Motherwell’s. 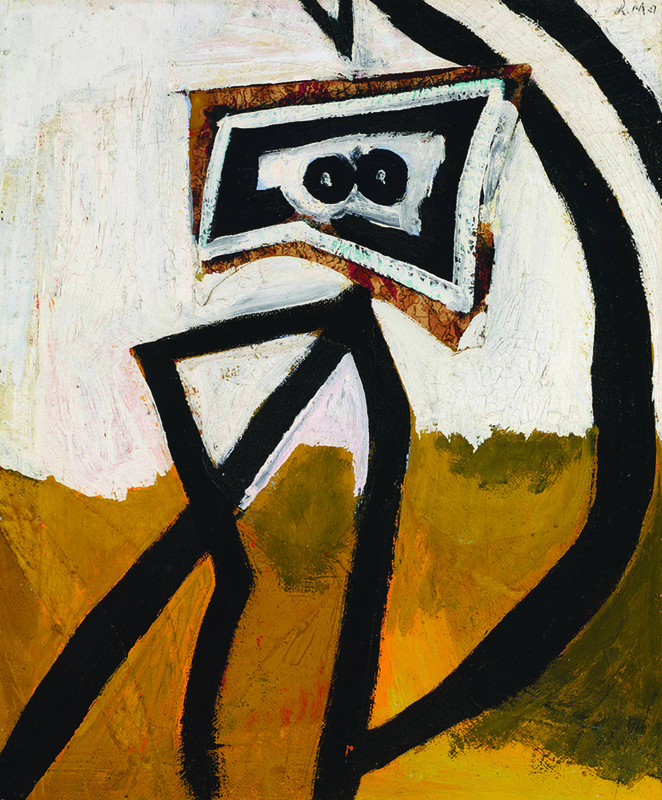 Utilizing varied textures, Motherwell’s In White and Yellow Ochre combines mediums with collaged materials, resulting in a harsher design and abstracted contours. In contrast, Frankenthaler uses oil paint like watercolor in Runningscape, thinning it into washes that bleed into each other to create a fluid design. Each of the artists’ larger pieces—Frankenthaler’s Canyon and Motherwell’s Chi Ama, Crede—also contain these distinctions, Canyon being composed of expansive fields of saturated color and Chi Ama, Crede of jagged applications in dull maroons and browns. What is interesting is that both artists were influenced by the same group of contemporaries: Abstract Expressionists such as Jackson Pollock, Willem de Kooning, and Mark Rothko. They also created these works in the early years of their marriage, when they were likely collaborating and comparing painting techniques. Their differences are thus results of their own personal styles retained throughout their independent careers. Frankenthaler’s paintings are distinctly feminine, whereas Motherwell’s works have a more aggressive appearance of masculinity. This pair of artists serve as a unique look at the female and male perspectives on a specific movement of art.